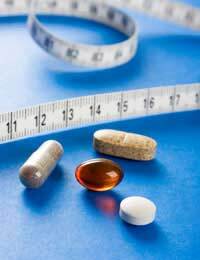 Diet pills often seem like a dream come true, a way to lose weight without having to change anything about your lifestyle. The most commonly advertised diet pills are over the counter and don't need a prescription to purchase, but most haven’t been proven very effective. Understanding common ingredients in diet pills, how diet pills work and potential side effects of diet pills will help you make more informed decisions about these products in the future. Chitosan. Made from chitin, present in the shells of shellfish like lobsters and crabs. CLA. Fatty acid from sunflowers or sunflower oil. DHEA. Hormone secreted by the adrenal gland. Ephedra. Also called Ma Huang. Usually combined with caffeine. Green tea extract. Derived from green tea leaves. Guar gum. From the husk of guar seeds. Guarana. Caffeine alkoloid (group of naturally occurring chemical compounds). Hydrocitric acid (HCA). From extracts of rare fruits. Psyllium. Soluble fibre. Laxative (stimulates bowel movements). Yohimbine. Alkoloid in the bark of the yohimbe tree (of West Africa). Increase your metabolism/burn more calories (ephedra, chromium, CLA, guarana, yohimbine). Make you feel full so you don’t want to eat any more (ephedra, guar gum and psyllium). Black fat from being absorbed (chitosan/chitin). Slow fat production (hydrocitric acid and green tea extract). Promote muscle growth to burn fat (CLA, DHEA). Diet pills are not magical solutions to weight loss problems, but they are items which should be taken seriously given that they interfere with your body’s normal processes. Knowing the relevant ingredients, how pills will work on your body and common side effects of diet pills is important to keeping yourself safe.